You may have noticed that Nic and I are big travellers, whether for our wonderful work on the matcha mission or in pursuit of our shared insatiable wanderlust. 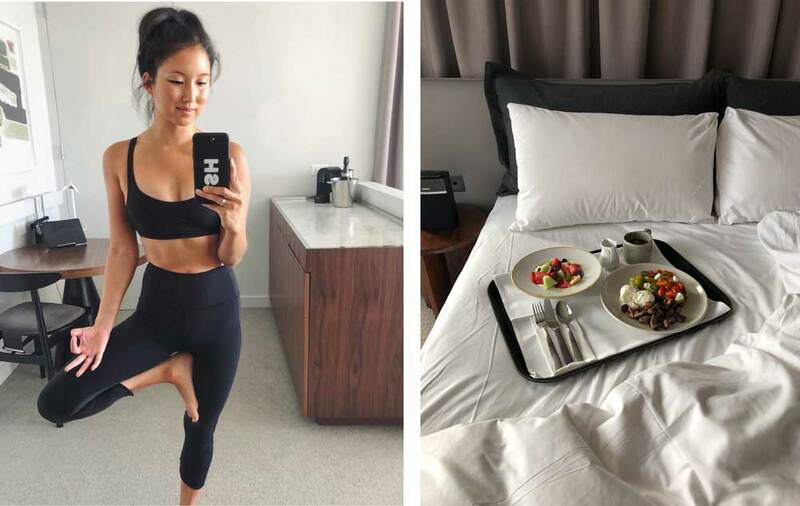 While there’s nothing quite like getting away from your daily routine to refresh your creativity, inspire reflection and encourage breakthroughs, it often also means getting away from your healthy habits. While it is undoubtedly more difficult to stick to your wellbeing regime when your environment is constantly changing and your routine is interrupted, experience has taught me that there are lots of simple ways to minimise the disruption of travel. I thought I’d share a few of these for you fellow travellers, based on our home away from home, The Larmont in Sydney. While I clearly love exercise, consistency is not my strong point even at the best of times. I know I need to minimise any barriers to moving my body as much as I can, so I always choose hotels with some kind of gym access. 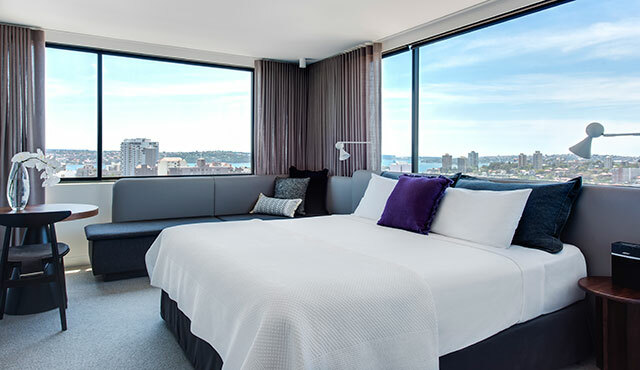 This is one of the reasons The Larmont has become our regular Sydney home – it not only offers guests free access to an in-house Anytime Fitness downstairs, but also shares its location with BodyMindLife Potts Point so guests can access FREE YOGA as well. No matter how jam-packed our Sydney visits get, there’s never an excuse not to move the body in some way during our stay. One of the strangest things that happens to me when I go away is that walking suddenly becomes my preferred method of transport. In theory, I would be the same at home, but something about the daily grind makes me jump to the car so I’m not “wasting time”. The Larmont is within walking distance of the CBD as well as so many of our favourites spots for eating, drinking or just people-watching. There’s a beautiful walk along Rushcutters Bay that I love to do in the evenings. Not only do you get to see a new city from a different perspective, 30 minutes of walking per day has been shown to have incredible benefits for maintaining overall health. It can increase cardiovascular fitness, strengthen bones, reduce excess body fat, and boost muscle power and endurance and, for anxious little bunnies like me, it can do wonders for managing anxiety and stress. I have such a love/hate relationship with sleep – it’s my favourite thing to do, but I also fight it most nights trying to squeeze as much into the day as I can. Because of the intensity of our days, the QUALITY of our sleep is even more important so I make sure to not only choose good hotels with high quality bedding but also bring along a little pack of goodies that help ensure a good night’s sleep. My main tip is to take an eye mask everywhere you go – you can never predict how the light will filter into a new room or what kind of devices will project light into your room, so an eye mask is a super cheap, compact way to ensure complete darkness to help you achieve a Sleeping Beauty slumber. I also take essential oils with me to help me wind down at the end of the day. There are so many things you can do to enhance your sleep that are portable, affordable and very effective! If you’re a fanatical foodie but also health nut like me, healthy food options are an essential part of your day. Travelling can break your nutrition routine, especially if you don’t have kitchen facilities – in fact, we often prefer not to because I think that testing out a city’s food scene is one of the best ways to experience its culture. So I always recommend staying in an area that is known for great, accessible healthy food options and then I do a bit of research before leaving to make a little to-do list. 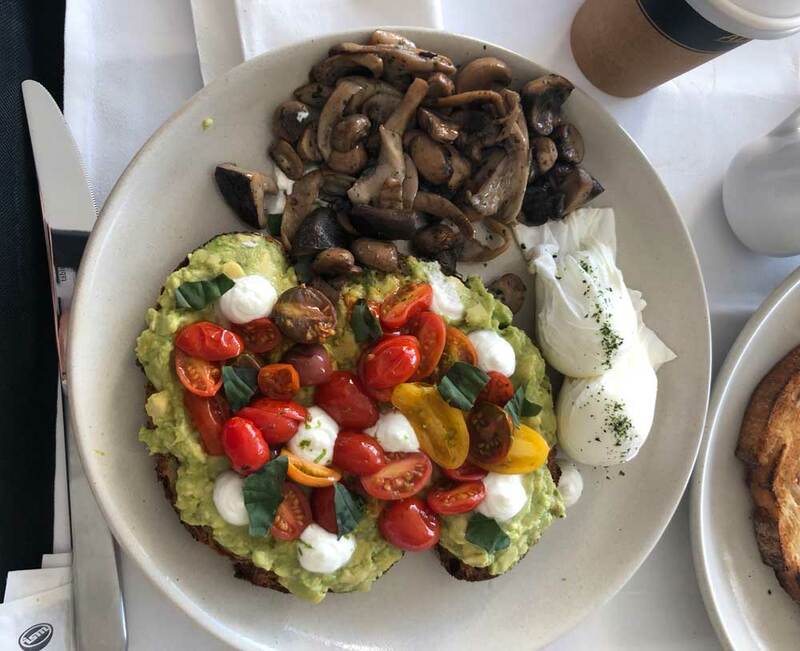 Some of our favourites in Sydney are Bondi Wholefoods, About Life, Porch and Parlour and The Grounds – depending on where you stay, there are so many options around town! I often forget how much plane time affects our body, especially when it’s just a 50 minute flight to Sydney. I feel like I’m just getting into the swing of things when the captain prepares the cabin for landing, so it feels like nothing but can really dehydrate your skin and take its toll on your body. So whenever there’s a plane involved, or any change of scenery really, it’s important to keep your body hydrated. I make an extra effort to get my H20 in on days when we’re away from home (which, when you’re overseas without drinkable tap water, can be difficult) – but you can always find water if you just prepare. Preparation is the key! Finally, the biggest thing is to enjoy yourself. There are so many things you can do to keep to your routine but at the same time, sometimes breaking routine is just as good for you. It’s important to always be able to be flexible with your goals or habits – life’s too short to be consistent and rigid all the time! So make sure you do also have a bit of fun and enjoy the moment! 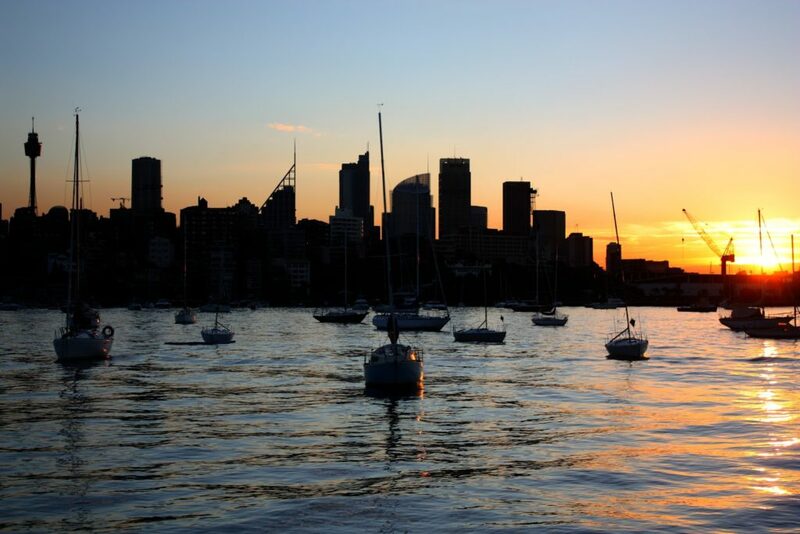 Head to The Larmont to find out more about this stunning Sydney haven.